Engineers at Purdue University have shown how to finely control the spectral properties of ultrafast light pulses, a step toward creating advanced sensors, more powerful communications technologies and more precise laboratory instruments. The laser pulses could be likened to strobes used in high-speed photography to freeze fast-moving objects such as bullets or flying insects. These laser pulses, however, are millions of times faster than such strobes, with flashes lasting a trillionth or quadrillionth of a second - a picosecond or femtosecond, respectively. The properties of the pulses, when represented on a graph, take on specific shapes that characterize the changing light intensity from the beginning to end of each pulse. Precisely controlling this intensity, which is called "pulse shaping," will enable researchers to tune the laser pulses to suit specific applications, said Andrew Weiner, Distinguished Professor of Electrical and Computer Engineering at Purdue. Researchers at other institutions have developed ultrafast lasers producing trains of pulses that are split into hundreds of thousands of segments, with each segment representing a different portion of the spectrum making up a pulse. The segments are called "comb lines" because they resemble teeth on a comb when represented on a graph, and the entire pulse train is called a "femtosecond frequency comb." The 2005 Nobel Prize in physics was awarded to researchers who precisely controlled the frequencies of these comb lines and demonstrated applications related to advanced optical clocks, which could improve communications, enhance navigation systems and enable new experiments to test physics theory, among other possible uses. In the new research, the Purdue engineers precisely "shaped" 100 comb lines from such a frequency comb in a single pulse. "There are still huge technological challenges ahead, but we really see 100 comb lines as a milestone, a significant step," Weiner said. 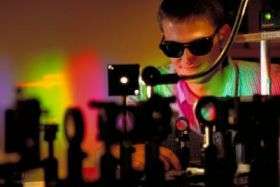 The research is based at Purdue's Ultrafast Optics and Optical Fiber Communications Laboratory. Findings are detailed in a research paper appearing online this week in the journal Nature Photonics. The paper was written by postdoctoral research associate Zhi Jiang, doctoral student Chen-Bin Huang, senior research scientist Daniel E. Leaird and Weiner, all in Purdue's School of Electrical and Computer Engineering. The pulse-shaping technique, called optical arbitrary waveform generation, is not new. However, the Purdue team is the first to accomplish shaping of light pulses from a femtosecond frequency comb and to demonstrate the technique on such a fine scale by controlling the properties of 100 spectral comb lines within each pulse. By precisely controlling this "fine frequency structure" of laser pulses, researchers hope to create advanced optical sensors that detect and measure hazardous materials or pollutants, ultra-sensitive spectroscopy for laboratory research, and optics-based communications systems that transmit greater volumes of information with better quality while increasing the bandwidth. However, fully realizing these goals will require controlling 100,000 to 1 million comb lines in each pulse, Weiner said. The advancement by the Purdue engineers enables the researchers to control the amplitude and "phase" of individual comb lines, or the high and low points of each spectral line, representing a step toward applying the technique for advanced technologies.